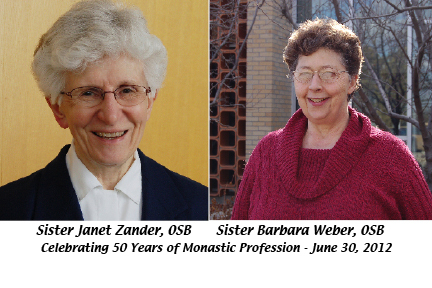 Sisters Barbara Weber and Janet Zander to celebrate 50th anniversary of monastic profession on June 30, 2012 - All are welcome! Sister Barbara Weber and Sister Janet Zander of Annunciation Monastery, Bismarck, will celebrate 50 years of monastic profession during the Eucharist on Saturday, June 30, at 1:30 p.m., Our Lady of the Annunciation Chapel at the Benedictine Center for Servant Leadership, Bismarck. The public is invited to this celebration and the reception, which will follow. Sister Barbara Weber, daughter of Leo and Mary Weber, grew up on a farm northeast of Hague, N.D. She is the second oldest of four sisters and four brothers. She graduated from St. Mary’s High School, Bismarck, in 1961. In 1977, with a degree in social work from Mary College (now the University of Mary), she began work as a social worker at St. Alexius Hospital (now St. Alexius Medical Center). In 2005, with a change in ministries, she continued her work at St. Alexius as a pastoral assistant on the telemetry and intensive care unit where she offers a comforting presence to patients and staff. In her spare time, Sister Barbara enjoys reading and writing letters to family and friends. She says the past 50 years have gone by quickly, with each passing year instilling an even deeper appreciation for Mass and daily common prayer with the sisters. Sister Janet began her ministry in elementary education, teaching at Cathedral Grade School in Bismarck, St. Patrick’s school in Dickinson, and Christ the King in Mandan. She then assisted in the monastery business office and served as secretary to the prioress for 11 years. When Sister Joanne Graham was prioress, she recognized Sister Janet’s gifts for liturgy and asked her to pursue a degree in liturgy at Notre Dame. In 1989 Sister Thomas Welder, who was president of the University of Mary at the time, invited Sister Janet to serve as her administrative assistant. Sister Janet continues in this position today, assisting University of Mary president, Father James Shea. “It is energizing to be in the university setting,” says Sister Janet. She values the students, wonderful colleagues, opportunities to learn, grow and enjoy convocations, drama, music, athletic events and daily walks with friends.